Dermot is a Druid and Scottish laird who has been alive for the past 1600 years. His wife was once the granddaughter of the Fae king. But she gave up her immortality to get married. When she died in an attack on Dermot’s clan, her mother cursed Dermot and his elite guard. They were to be immortal until Dermot could find the reincarnated soul of his wife and bring her back to the place where she died. After all these years, her soul has now reincarnated. Dermot finds her in Sidney St George, an American woman who knows nothing of her past life. Dermot tracks her down, having no intention of developing any feelings for her. But you know how these things go. Even though they fight it, their souls reach out to one another. Sidney doubts Dermot’s intentions and as she begins to fall for him; she is sure her feelings can never be returned. At the same time, Dermot is struggling with his new-found emotions and weighing his own feelings against his responsibilities to his men. All of that angst creates enough of a problem, but the Fae princess who cursed Dermot refuses to allow his suffering to end. She throws one obstacle their way after another, hoping to keep his torment alive. Plus, there is the threat that if the curse does end, the men won’t just regain their mortality; they’ll die on the spot. The book started off a little slow for me. I had a hard time connecting with the characters and I thought it was going to end up being a pretty dry read. But somewhere around the halfway point, a little bit of magic happened and the book came alive. I think it was around the same time that Sidney allowed herself to believe in Dermot’s immortality. That’s the time the two of them slowly began to take down their walls. The sexual element was pretty good; and as much as I liked the development of Sidney and Dermot’s relationship… the secondary love story between her best friend Zoe and Dermot’s cousin Thomas was just as endearing, if not more so. Dermot and his men all spoke with a great brogue. 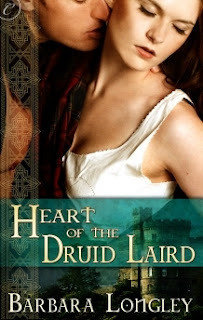 And I’m a firm believer that no book can truly be called a Highlander story without the words, “Och,” “ken” and “lass.” We get all of these plus a few Gaelic term of endearment. Yay! I ended up rather liking this book. I’m glad I stuck with it, because it paid off in the end. 4 stars. I liked the development of Sidney and Dermot’s relationship… the secondary love story between her best friend Zoe and Dermot’s cousin Thomas was just as endearing, if not more so.